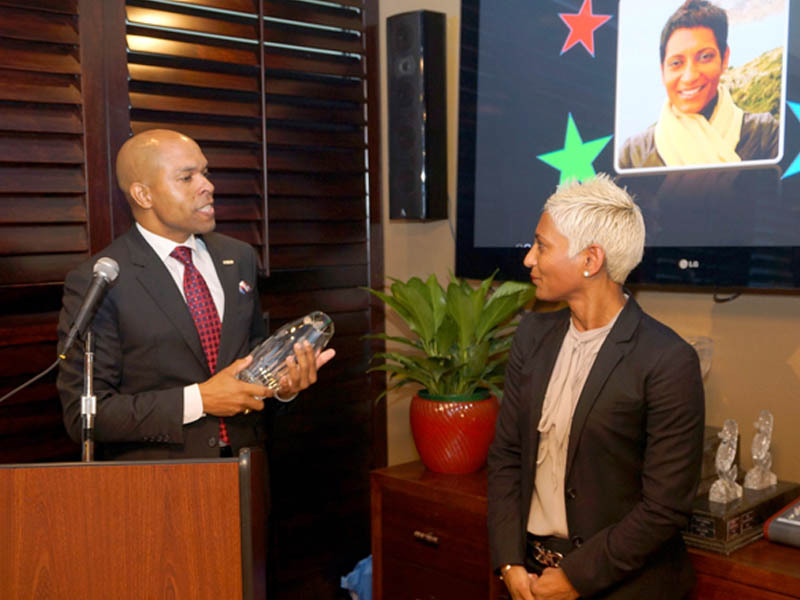 The Bermuda Hotel Association announced that Mrs. Nagma Walker, General Manager of the Reefs Hotel in Southampton, has been named as the 2013 Hotelier of the Year. Mrs. Walker was honored by her colleagues at the recent Annual Bermuda Hotel Association luncheon which took place on Thursday, 11th December 2014 at the Beau Rivage Restaurant, Newstead Belmont Hills, with her husband, Mr. Allan Walker and family members also in attendance. Mrs. Walker was unanimously selected by past winners of the award, which was presented to her by Minister of Tourism Development and Transport Shawn Crockwell. Minister Crockwell commented that he was very pleased to present Mrs. Walker with the award and thanked her for her commitment, dedication and high standards of service to her hotel guests and the industry, as well as her ongoing involvement in wider community based charitable endeavors. Additionally she thanked the owner, Mr. Dodwell and her management colleagues at the Reefs for their ongoing support and guidance and assistance in permitting her to excel in her role. Mr. JP Martins, Bermuda Hotel Association President and Mr. Bushara Bushara, Vice President also extended congratulations and thanks to Mrs. Walker on her having received the annual award and her unwavering commitment and dedication to the hospitality and hotel industry. They further extended their congratulations to John Barritt & Son Ltd. on their having been awarded the 2014 Corporate Citizen of the Year Award. 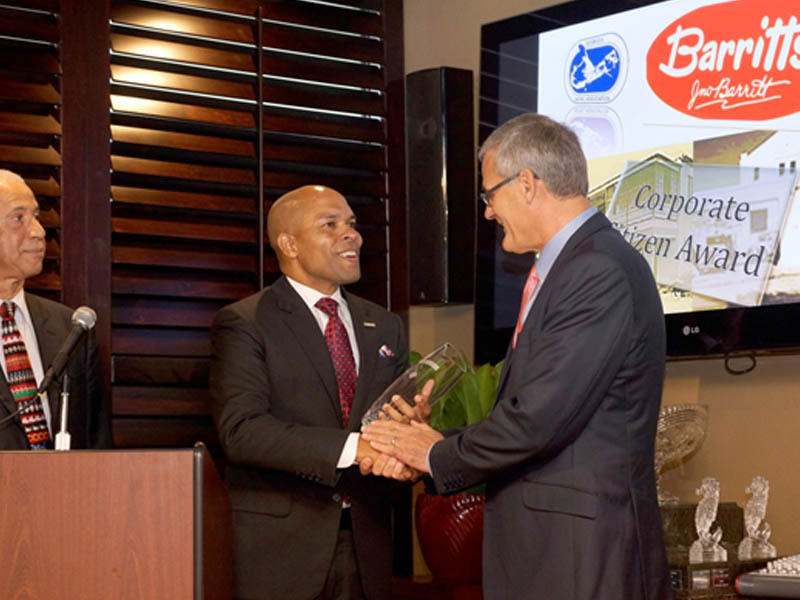 BHA Chief Executive Officer Stephen Todd said, “Barritt’s were a very deserving recipient of the award, given their ongoing commitment, event sponsorships, and charitable giving to the wider Bermuda Community over their 140 years of service, as well as their flying the Bermuda flag internationally through the marketing and promotion of their premier beverage, Barritt’s Bermuda Stone Ginger Beer. Mr. Bruce Barritt, General Manager of Barritt’s, said he was very pleased to accept it on behalf of his family, the company and their loyal employees, as he also wished to acknowledge the relationship they enjoyed with the BHA members and their ongoing commitment to the wider community as a responsible corporate citizen. Well done Nagma! Now here is a person who truly deserves this award. Congratulations Nagma! Well done and well deserved! !